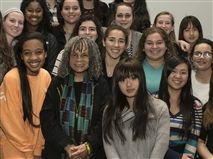 On Monday, January 19, Miss Porter's School welcomed award-winning poet, playwright, and activist Sonia Sanchez as Haggis Baggis speaker. During her time on campus, Dr. Sanchez served as keynote speaker for the school's Martin Luther King, Jr. Day celebration, discussing her work as a poet-activist and her lifelong commitment to social justice. That evening she had dinner with students, faculty, and the Haggis Baggis editorial staff and addressed the entire school community in an evening presentation, during which she discussed her life as a writer and teacher and gave a poetry reading. Dr. Sanchez is one of the most prominent writers of the Black Arts movement, speaking on black culture and literature, women's liberation, peace, and racial justice. She is one of 20 African American women featured in Freedom's Sisters, an interactive exhibition created by the Cincinnati Museum Center and Smithsonian Institution Traveling Exhibition Service; is a sponsor of the Women's International League for Peace and Freedom; and serves on the board of MADRE, an international women's human rights organization. Dr. Sanchez is the author of more than 16 books and numerous plays and has released two recorded albums of her work. She is also a contributing editor to Black Scholar and The Journal of African Studies. Dr. Sanchez has received several honors for her writing and service, including the Lucretia Mott Award, the Outstanding Arts Award from the Pennsylvania Coalition of 100 Black Women, the Governor's Award for Excellence in the Humanities, and the Langston Hughes Poetry Award, among others. Haggis Baggis is the student publication for literary work and the fine arts. The annual Haggis Baggis reading is supported by the Elisabeth S. Hadden '76 Memorial Fund, established in 1976 in her memory by her family and friends.